Before launching into addressing the various elements of King James Onlyism, I thought I would begin by first providing an outline of what I believe are the 6 key arguments King James only (KJVO) advocates use to defend their view point that the King James Version, originally published in 1611, is the only Bible that contains the pure, infallible, and inerrant Word of God. These arguments may not be a complete list, but I know I would incorporate these in my apologetics defending KJV onlyism. If this presupposition is true, the reverse will be true as well: the KJV alone can only be God’s Word alone. God has given us only one Bible, they claim, not a multitude of Bibles. Only the KJV represents God’s Word, thus, any other translation that will alter the reading of the KJV in either updating its language or producing translational revision is in essence changing the Word of God. KJVO advocates claim God has made clear promises to preserve His Word for ever. This promise of preservation is seen in such passages as Psalm 12:7 and Matthew 5:17,18. This promise of preservation goes beyond just the general message of the scriptures to the very words. God did not promise He will preserve His Word (singular), but His Words (plural). If not every word God breathed out is preserved, then we cannot say with certainty that the scriptures are pure and inerrant. KJVO advocates make the claim that the King James Bible is translated from the best original manuscripts. The KJV translators used the 1525 Daniel Bomberg, 2nd edition of the Jacob Ben-Chayyim Masoretic text for the Old Testament and the Received Text, originally published by Roman Catholic scholar Desiderius Erasmus, for the New Testament. 1). They represent the majority of ancient, manuscript witnesses. 2). These ancient manuscripts were used consistently and with out interruption by God’s believing people. 3). These ancient manuscripts were never lost to the “sea of time” or ever laid aside by God’s people. They were continually copied and re-copied and show signs of being worn out from use, thus indicating the confidence God’s people placed in them as being God’s holy Word. 2). These manuscripts have their origin in and around Alexandria, Egypt, an area known for false teaching. 3). The manuscripts utilized by modern translations are in pristine condition, indicating they were never used by God’s people. 4). These manuscripts give the appearance they were altered or corrupted by heretical men who desired to undermine Christian doctrine. God’s Word, based upon Psalm 12:6,7, has gone through a seven-fold purification process in the English language. 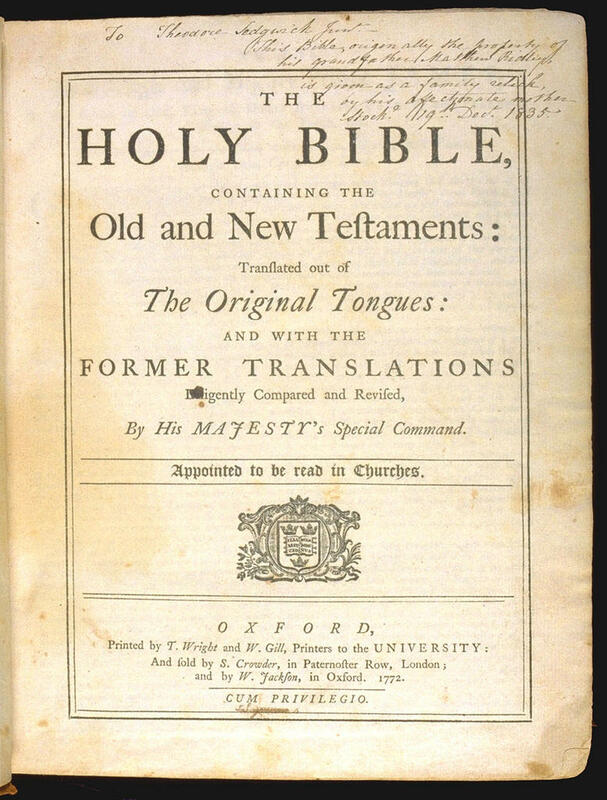 Beginning with Wycliff’s Lollard translations, then the Tyndale’s Bible, the Coverdale Bible, Matthew’s Bible, the Geneva Bible, the Bishop’s Bible and then the King James Bible. This providentially guided process certified the purity of God’s Word as He divinely guided the translators to burn off any dross by their continual translation. The King James represents the culmination of purity. (It should be noted that the “seven-fold” list is not standard and differs among KJVO advocates). The King James was translated by the greatest textual scholars in all of Church History. All of the men who helped to translate the King James Bible were the world’s experts in the fields of biblical languages and theology. God specifically directed these men by divine providence to use their expertise so as to provide His people with the best translation that represents His holy Word. The King James Bible demonstrates God's hand of blessing by how it has impacted world history. 1). The forerunner English translations (along with the original language texts used in translating the KJV) where all instrumental in the shaping of the Reformation led by Martin Luther, John Calvin, and John Knox. 3). It was the translation utilized in the preaching of the two Great Awakenings in America. Both Jonathan Edwards and George Whitfield used the KJV when they preached. 4). It was the translation carried around the world in the great missionary endeavors of the 18th and 19th centuries. 5). All of the wonderful Christian literature published in the 1600s by the Puritans and Baptists used the KJV. Now as my series progresses, I hope to draw my posts around the claims put forth in these 6 arguments. They will help us frame the discussion in a more cohesive manner. When I presented my KJV series in spoken format, I wedged an historical overview of the development of KJV onlyism in between my testimony and the introduction to these arguments. To save a little time, I would encourage readers to take a look at Doug Kutilek's article, The Unlearned Men, that provides a good summary background to the origins of KJV onlyism being founded upon the writings of a 7th Day Adventist by the name of Benjamin Wilkinson. 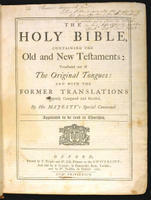 Wilkinson did not like the new Revised Version because it changed some of his pet, Adventist verses and so he responded by writing one of the first ever books defending the idea the King James Bible was God's final authority. He was also the first person to libel the character of Westcott and Hort as being liberal, Bible correcting heretics. The next time, I will start with argument number one, the Exclusivity argument. I look forward to the series. Looks real good. I'm looking forward too. I have repeatedly asked many KJVOs to provide evidence that the current KJVO myth was practiced before 1930, and all I've ever received are excuses and spin. the evidence is quite plain that the myth did NOT start before 1930, and wasn't really apread to the public before 1955, and wasn't big-time until after 1970. it is a new doctrine spread by dishonest authors who try to post their imaginations before the public in order to keep themselves livin' large. their interese is NOT in God's words no matter how sincere they sound. You have expounded upon an argument I've used for many years against the KJVO myth...IT HAS ABSOLUTELY NO SCRIPTURAL SUPPORT WHATSOEVER! Nowhere in the KJV are there any exhortations to use only the KJV...Not even a HINT, using the broadest of implication. In fact, the AV translators themselves DENY onlyism; they say that even the meanest(poorest) of translations IS the word of God. The KJVOs argue that we Freedom readers are attacking the KJV. That is one of the poorest of their arguments. But we must remember that they have no VIABLE evidence supporting their myth, and half their worship experience consists of inventing arguments trying to support their man-made false doctrine, a doctrine they've tried to ADD to the pantheon of doctrines provided by GOD. That pantheon was finalized and closed when John received the Revelation, but man has tried to add to it from Day One, and KJVO is just another of these attempts at addition. I,too, am looking forward to your series, and will add my commentary to the mix, and assist as requested. Yes, Roby my friend, I do remember you quite well. I think you had some of the best stuff against Will Kinney and his pals back on the KJV only discussion board from about 2 years ago. I look forward to your imput as I plod along. First thing I'm gonna hafta do is proofread a little better. I spelled "Christ" as "Chrost" in my closing earlier! Mr. Kinney won't remain too long where his views are challenged. For the other readers, his game is to compare various Bible versions, using the KJV as the standard, pointing out where they differ from the KJV, and from this, to state the other versions are wrong. In reality, the Hebrew and Greek sources from which the KJV was made often reveal that the other version(s) often have the BETTER English rendering. Not to mention that the original KJV, the AV 1611, often proves Mr. Kinney's statements wrong. A clear example of this is his argument against other versions' use of 'morning star' in isaiah 14:12. The AV 1611 has this marginal note for"Lucifer" in this verse..."or, O day starre". Mr. Kinney's usual handle is "Brandplucked" where he doesn't use his name Will Kinney. ** Neither are we saying that Herod was an Easter worshiper, although he may have been, but he did have subjects in his kingdom (Syria [Phoenicia], Abilene, Galilee, Judaea [Palestine], Samaria) that were, and just as he wanted to please the Jews, he likewise wanted to please the pagans of his kingdom. As a politician Agrippa please the Jews using the pretense of their religion, while at the same time taking part in pagan festivities in the Gentile areas of his realm. It was his political expertizes, not Judaism, that led him to "... vex certain of the church ... [and] to take Peter..." (Acts 12:1-3). It was "because he saw it pleased the Jews" (Acts 12:3). The Herod of Acts 12 is Herod Agrippa I. Agrippa's grandfather was Herod the Great who killed the children after the birth of the Lord Jesus. Herod the Great also built a temple and idols for Caesar Augustus in Caesarea (this is where Agrippa retreated after Peter escaped). The idols were of Zeus and Hera , the queen of heaven. Alfred Edersheim says, "... Herod the Great and his immediate successors built a number of towns, which were inhabited chiefly by Gentiles, and had independent constitutions, like those of the Hellenic cities. Thus, Herod himself built ... Caesarea in the west, commanding the sea-coast ... (Josephus, Ant. xiii. 15. 1; War i. 21. 8.) .... [D]espite his profession of Judaism, he reared magnificent heathen temples .... Although each of these towns and districts had its special deities and rites, some being determined by local traditions, their prevailing character may be described as a mixture of Greek and Syrian worship, the former preponderating .... [In] the temple which Herod built to Augustus in Caesarea, there were statues of the Emperor as Olympian Zeus, and of Rome as Hera . [Josephus, Ant. xv. 9. 6; War i. 21. 5-8.] He was wont to excuse this conformity to heathenism before his own people on the ground of political necessity. Yet, even if his religious inclinations had not been in that direction, he would have earnestly striven to Grecianise the people. Not only in Caesarea, but even in Jerusalem ..." (The Life and Times of Jesus the Messiah, Book I, Chap. VII, pp. 88-89, Alfred Edersheim, 1886). Ashtoreth / Baal corresponding to Ishtar / Tammuz, and Zeus / Hera were all venerated in Herod's kingdom. Even if they were not Herod's gods, as a politically minded pagan would not want to offend those who honored this goddess. [[Thank you for the fairly-extensive history you posted, but I already knew it, having read the works of Flavius Josephus, & having access to several authoritative references such as "Encyclopedia Britannica". Exodus 12: 1And the LORD spake unto Moses and Aaron in the land of Egypt saying 2This month shall be unto you the beginning of months: it shall be the first month of the year to you. 3Speak ye unto all the congregation of Israel, saying, In the tenth day of this month they shall take to them every man a lamb, according to the house of their fathers, a lamb for an house: 6And ye shall keep it up until the fourteenth day of the same month: and the whole assembly of the congregation of Israel shall kill it in the evening. 14And this day shall be unto you for a memorial; and ye shall keep it a feast to the LORD throughout your generations; ye shall keep it a feast by an ordinance for ever. 15Seven days shall ye eat unleavened bread; even the first day ye shall put away leaven out of your houses: for whosoever eateth leavened bread from the first day until the seventh day, that soul shall be cut off from Israel. 16And in the first day there shall be an holy convocation, and in the seventh day there shall be an holy convocation to you; no manner of work shall be done in them, save that which every man must eat, that only may be done of you. 17And ye shall observe the feast of unleavened bread; for in this selfsame day have I brought your armies out of the land of Egypt: therefore shall ye observe this day in your generations by an ordinance for ever. 18In the first month, on the fourteenth day of the month at even, ye shall eat unleavened bread, until the one and twentieth day of the month at even. Here, God establishes the exact dates, starting time, and ending time for the entire observance...and in V.18,He establishes that the people are to eat only unleavened bread from the time of the paschal meal until the end of the observance. (It's a gimme that the people could eat other foods long as they were unleavened also, as the LAMB certainly isn't bread!) Please keep in mind the time of the first holy convocation in V.16 as I'll be referring to it later. ** This is faulty interpretation. First, Exodus 12 speaks of Passover from verse 1 to verse 14; then from verse 15 to 17 it speaks of Unleavened Bread. They are two distinct feasts. Now for Ezekiel 45:21: the comma after the word "passover" divides the two feasts. How do we know? Look at Exodus 12:18 again. It speaks of "the fourteenth day of the month ... until the one and twentieth day of the month." Count them: 1) the 14th, 2) the 15th, 3) the 16th, 4) the 17th, 5) the 18th, 6) the 19th, 7) the 20th, 8) the 21th. That's eight days, not seven. This is further verified by looking at these passages. Leviticus 23:4-8: "These are the feasts of the LORD, even holy convocations, which ye shall proclaim in their seasons. In the fourteenth day of the first month at even is the LORD’S passover. And on the fifteenth day of the same month is the feast of unleavened bread unto the LORD: seven days ye must eat unleavened bread. In the first day ye shall have an holy convocation: ye shall do no servile work therein. But ye shall offer an offering made by fire unto the LORD seven days: in the seventh day is an holy convocation: ye shall do no servile work therein. Numbers 28:16-17: "And in the fourteenth day of the first month is the passover of the LORD. And in the fifteenth day of this month is the feast: seven days shall unleavened bread be eaten." Numbers 33:3: "And they departed from Rameses in the first month, on the fifteenth day of the first month; on the morrow after the passover the children of Israel went out with an high hand in the sight of all the Egyptians." [[Perhaps I shouldn't have stopped with just the one verse from Ezekiel. But first, if in English we remove the comma from the verse, it would read quite awkwardly, same as if I removed the commas from this sentence. Eze.45:21, KJV...In the first month, in the fourteenth day of the month, ye shall have the passover, a feast of seven days; unleavened bread shall be eaten.22And upon that day shall the prince prepare for himself and for all the people of the land a bullock for a sin offering.23And seven days of the feast he shall prepare a burnt offering to the LORD, seven bullocks and seven rams without blemish daily the seven days; and a kid of the goats daily for a sin offering. ** Wrong. No where in Scripture is Unleavened Bread called Passover. Although Passover is called "the [singular] day of unleavened bread." Luke 22:7: "Then came the day of unleavened bread, when the passover must be killed." [[ NO, ____; YOU are wrong. What part of Matthew 26:17 Now the FIRST DAY of the FEAST OF UNLEAVENED BREAD..." is over your head? And if your supposition were correct, then the resta the verse is incorrect! "...the disciples came to Jesus, saying unto him, Where wilt thou that we prepare for thee to EAT THE PASSOVER?" By your premise, they woulda been a day late! Now we know Jesus had eaten the paschal meal the previous evening before he was arrested & taken before Annas & Caiaphas. After He was seen by Caiaphas, the events of the above verse occurred. Knowing the paschal meal had already happened, to what was John referring when he said, "eat the passover"? Why, the special meals consisting entirely of unleavened bread and other unleavened foods, of course. He had hearkened to God when He had said the ENTIRE WEEK was Passover. ** Who knows why they thought they could eat at that late hour. ** He did no such thing. It was Passover till evening, and then the special Sabbath and high day of Feast of Unleavened Bread would begin. ** This has already been addressed. The preparation and eating of the symbolic type had been done on the previous evening. John 19:14 is clearly speaking of the fulfillment of the type. It was the preparation of "the Lamb of God, which taketh away the sin of the world" (John 1:29). The next reference to the Lord's Passover in the Bible, and Easter is not the Lord's, is in 1 Corinthians 5:7: "... Christ our passover is sacrificed for us." [[Total guesswork. If Herod had been waiting for anything like that, he would NOT have arrested Peter at that time. And I told you once that there's not the smallest blip of historical evidence suggesting Herod was planning to hold Peter until some pagan party was over. He was holding Peter until PASSOVER WEEK was over. If anything Herod mighta been observing was too sacred for Herod to give Peter to the Jews, it woulda been too sacred for him to have arrested Peter in the first place. Common sense. And I believe you know there's not a hint of SCRIPTURE saying Herod was observing a pagan ceremony at the time. ** Acts 12.4 is the only place in the Word of God that "Easter" can rightly be uses to translate the Hebrew word, pesach (or Greek: pascha ). Passover would not be wrong, but Easter in this one place is better, as the context shows that it was not the Lord's Passover (Ex 12:11, 27; Lev 23:5). The Holy Spirit signified this by saying, "Then were the days of unleavened bread" (Acts 12:3). These seven feast days of unleavened bread are separate and distinct from the one day of Passover and they come after Passover. Therefore, Passover had already passed. Acts 12:4 was not the Lord's Passover, but rather was a pagan Easter passover as signified by the name used to translate pascha . I Kings 18 presents a prophetic picture in type of the Easter of Acts 12 (i.e. "the prophets of the groves " [1 Kings 18:19]; "groves" = Asherah were tree idols to "Ashtoreth the goddess of the Zidonians" [1 Kings 11:33]. Ashtoreth, Ishtar, Astarte, Easter all mean star and are the same false goddess. "And [the prophets of Ashtoreth] leaped [pacach ] upon the altar which was made" [1 Kings 18:26]; "pacach" meaning "pass over" [Ex 12:13, 23] is the root word for pesach = Passover. cf. 1 Kings 18:17- 29). Passover of the Old and New testaments pertains to the sacrificial death and the resurrection of the Lord Jesus Christ. Easter of Acts12 pertains to useless sacrifices to Ashtoreth the goddess of the Zidonians who is the same as Ishtar of the Babylonians, and Easter the goddess of the Druids. [[I used Scripture from your own fave Bible version, while you fished, guessed, wished, and conjectured. WHOM DO YOU BELIEVE, READERS?...Scriptural fact, or guesswork, points not found in Scripture at all? The guesswork about herod and some pagan Raster is total baloney. WHERE'S ANY EVIDENCE SUPPORTING IT? NOT IN SCRIPTURE! Nor is it in secular history! That leaves only GUESSWORK.